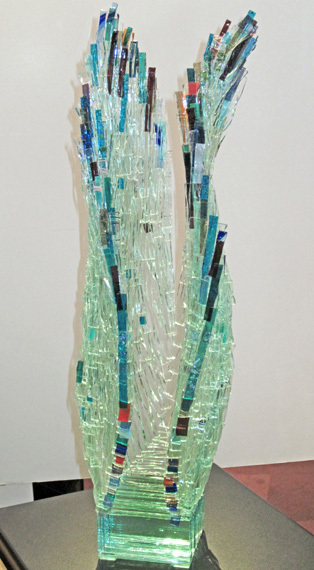 Gundi Finch is a glass artist native to Germany. 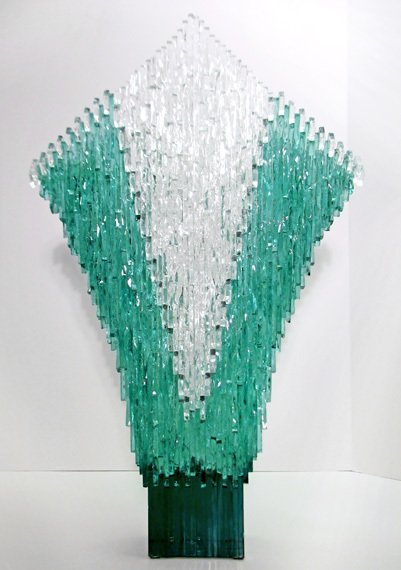 Though she now lives in North America, she lived in the seductive sunny climate of Chile for 20 years before moving to Canada in 1973.One might think that the inspiration for her creations in glass come from the extreme cold and intense light of the Canadian winter or perhaps the sparkling icicles that form around the waterfalls tumbling over the escarpment. 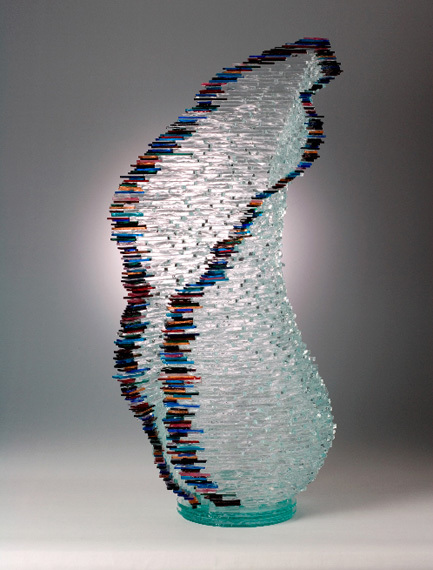 Nature is, indeed, a source of the vibrant energy and flowing shapes that permeate Gundi’s larger sculptural pieces; shapes that contrast strongly with the regularly layered levels of glass. The more compact bowls, lights, mirrors, and candle holders are artful, whimsical, angular, and very useful! 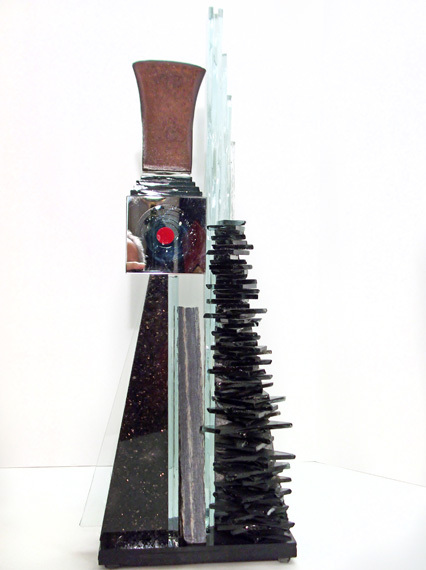 The sculptures reflect Finch’s innate sense of design, enhanced by her several years as a fashion designer; here she specialized in the design and production of suede and leather garments in the early 1980’s. 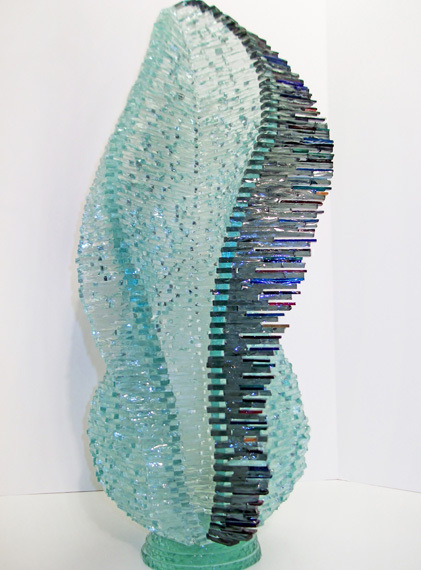 Each piece is painstakingly created by cutting plate glass into small pieces, tumbling them to take away sharp edges, and then assembling into stunning forms, using an ultra-strong clear bonding adhesive. This unique creative process yields multi-faceted sculptures, which glint beautifully in sunlight and form wonderful centerpieces when enhanced by spot lighting or illuminated from below-especially at night. The end results are: Magic Carpet, Calla, Bird of Paradise, Ostra, Waves, Deco Bowl, & Tulipa-all pieces breathe life and light, in a beguiling mix of brittle strength and supple fluidity.